I’m not sure where I first saw this technique. 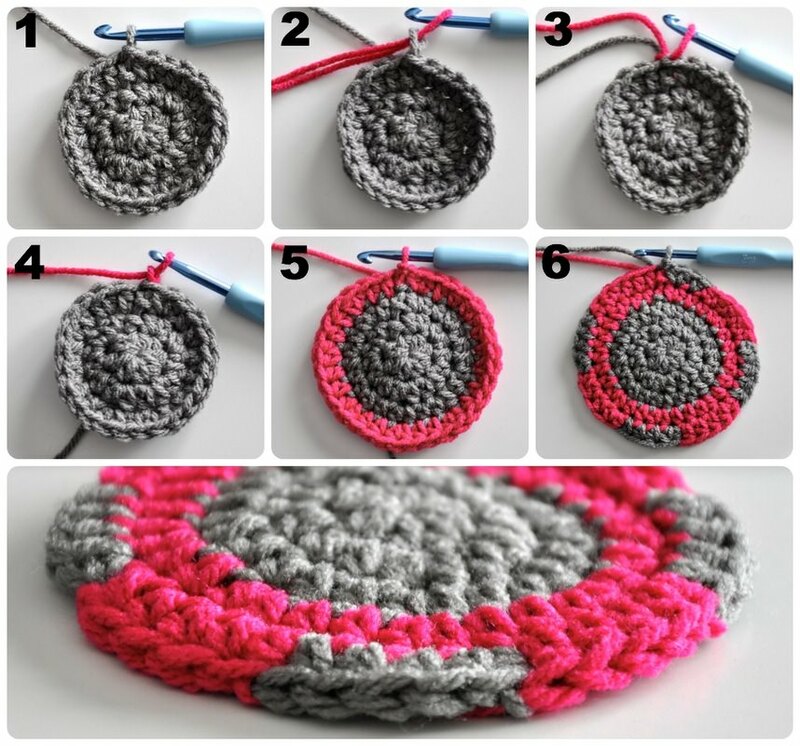 It was sometime when I had first started crocheting and it became such a habit of mine that I actually forgot that there was another way! I change colors a little differently than most people and it’s definitely not the way we are taught when first learning. The great thing about this way is that your changes are a lot tighter. I find with the traditional method of changing colors, on the last pull through of your last stitch, it can create a loose stitch. I’m not a fan. This method keeps things clean.Ready? Photo 1: This photo shows the join at the end of my third Round. Join with your old color. In the other method, you would normally join to the first stitch (or chain) with the new color to start your color change. In this method you do not. Photo 2: Pull up slightly on the loop that is on your hook, make a loop with the new color and pull it through the loop on your hook. Photo 3: Pull down firmly on the working yarn of the old color. Photo 4: Chain and begin the next Round/Row/Stitch with your new color. Photo 5: Shows a completed Round. Photo 6: Here you can see what it looks like when I change colors in the middle of the Round. See how nice and clean it is?!?! The bottom photo is a close up to show you what it looks like from the top edge. Make sure to let me know what you think! Is it something you want to try? Do you prefer a different way? I would love to hear about it!